This clock hung in the bedroom back in Oklahoma for many, many years. Why - in part the drop dead gorgeous case - but for the most part because I was so enamored with the mechanism when I went through it soon after my buyer found it in Austria. Back in those days I didn't photo-document the mechanisms I restored – pity that. But, in as this clock has recently sold I had the chance to go through it again. It was every bit as wonderful as I remembered. The details I point out in several of the pictures point to a master far from the heaven that Vienna must have been for clock makers in the 1800’s. Provincial makers couldn’t go down the street and buy a pair of hands or pulleys, or even winding drums. So, they made them themselves. And it is this lack of “standard” parts that make these clocks so wonderful. And, to me, collectible. 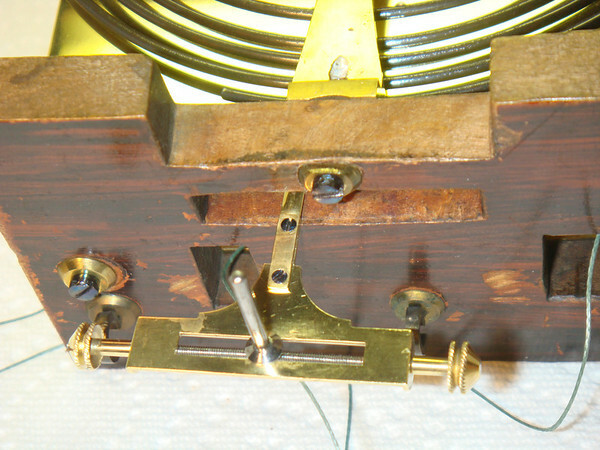 A simple two weight in a time when two weights were not popular, from a town not noted for clock making. But, at the end of the day, a masterpiece. I can only hope you enjoy the pictures as much as I enjoyed restoring this piece. A minor detail, but I love the absolutely perfect and ever so small screws attaching the crutch arm to the crutch pin bracket.